The photograph which went went viral on social networking sites. Dhubri Police on Monday arrested two persons for their alleged role in leaking question papers of recruitment examination of the Panchayat and Rural Development (P&RD) Department, which was held across the State on May 20. Dhubri Additional Superintendent of Police confirmed that two accused — Rupali Saha and Sabira Khatun — were arrested on the basis of a complaint lodged by an examination centre in-charge. Sabira is a resident of Dhubri town while Rupali is an inhabitant of Golakganj town of Dhubri district. Adding further, Deka said a case (646/2018) has already been registered with Dhubri Police Station under relevant sections of the IPC and further investigation was under way. It has been reported from across the State about the numerous anomalies during the examination. 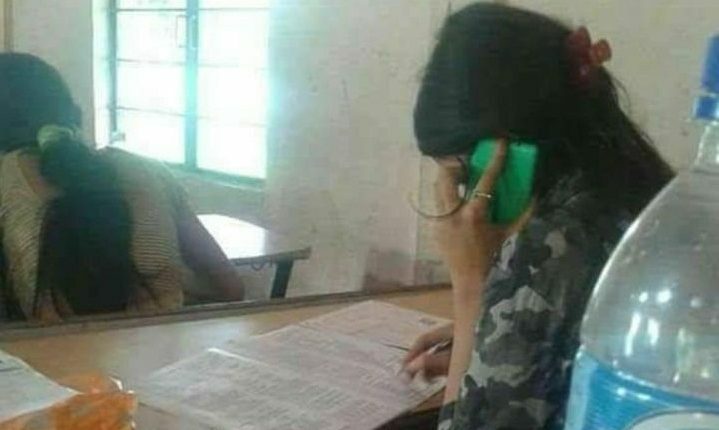 Immediately after the examination commenced, there were reports from various parts of Assam that question papers got leaked prior to the scheduled time of the commencement of the P&RD recruitment examination.